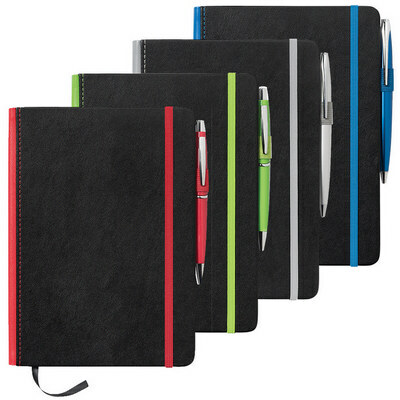 Description: Trimmed with some colour down the spine this notebook has a built-in elastic closure, ribbon marker, pen loop & document pocket on inside back cover. Pen not included. Available in 4 colours. Lined white paper. Features: Packaging: Polybag Colour: Blue Material: Soft PU Product Size: 140mm(w) x 212mm(h) Freight details : 36 per carton, 11.8kgs, 36 x 33 x 23cms; Decoration Type(s): Colour Print / Deboss / Debossed Foil / Foil Stamp / Full Colour Print Decoration Area: 75mm(w) x 125mm(h). Price includes : 1 Colour 1 Position Print. Setup is included.